Villa Cintra is a set of 2 houses of the 19th century recently restored. 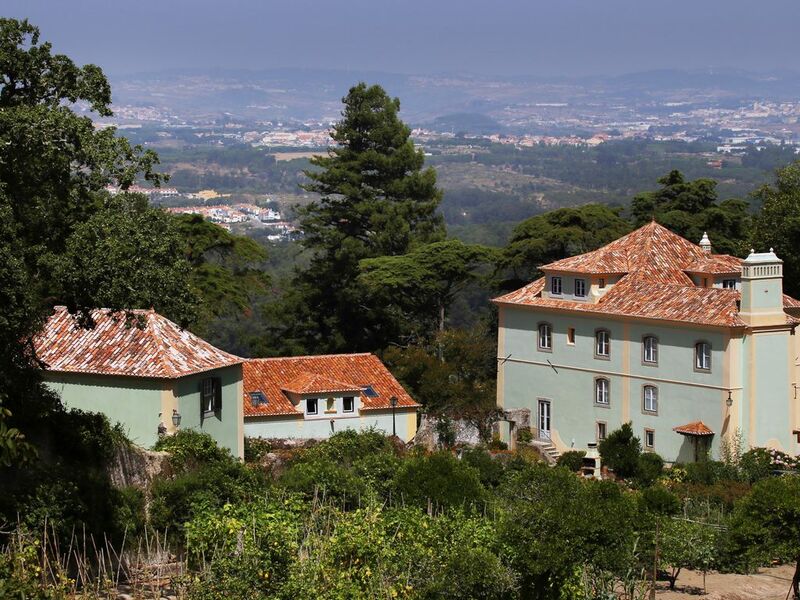 Villa Cintra is a set of two houses located in the historic center of Sintra. They are within a property of approximately 20,000 square meters with beautiful gardens. It has 5 Bedrooms - 10 beds, 4 Bathrooms, 2 Kitchens. Maximum 12 people. Free Wifi, Cable Tv, Swimming Pool, Barbecue, Free Parking, Washing machine. Ideal for families with children. Bus Stop at the Gate and all sort of transports nearby. Sintra, Granted worldwide patrimony of humanity by UNESCO with its cultural landscape dotted with palaces, castles and museums. Cabo da Roca, the westernmost point in continental Europe, is Within 10 minutes' drive. The nearest beach is only 10 minutes by car from the property, with a wide choice of bars and restaurants. Along the coast, the choice of other beaches is endless, famous for the water sport activities and its white sandy beaches family, all Within 20 min. The best guests we ever had definitely!! They left the houses in perfect condition. All of them super nice. No one ever left the houses like this! Hope to see you again anytime soon. Leonor and her mother Ana were excellent and gracious hosts. I rented the space for family to celebrate our marriage and wedding in Sintra. Everything went smoothly, communication was prompt and professional. Ana was even willing to accommodate some situations that came up due to the wedding, for which we were grateful. I wouldn't hesitate to recommend their home to others. Kent and his family were excellent guests! We were very happy to meet them. They left the houses in perfect conditions! Hope them come some other time to stay with us. It’s for people like them that we love what we do! This property has extensive grounds which are great fun for children to explore and has an unusually large swimming pool. However it will suit some groups better than other. The two houses are approximately 50 meters apart and the house with 3 bedrooms is actually a first floor apartment so there is no opportunity to wander directly in and out of the garden. Our stay left an unpleasant taste in our mouths when we returned home to find a significant sum had quite unexpectedly been retained from our deposit. I would advise any visitor to keep careful documentation of any deterioration or damage to the property or its furnishings that they notice on arrival otherwise they could find themselves with an unexpected cost. Not a relaxing way to start a holiday. 1) The so called "flat" is in reality a two story house. The only thing that makes you classify it as such, is the fact you have to go up 6 steps to access the gardens! 2) It's a universally accepted rule that whoever rents a house is responsible for all the damages that occur and therefore has to respond for them. The chairs were in perfect condition. Besides the fact that you tried to pressure us, in your email, implying your comment depended on our attitude. As we didn't comply, here is the result! Please read all our reviews and see the difference. 3) As hosts our main purpose is always to make sure our guests enjoy a most pleasant and unforgettable experience, in a cozy and familiar environment, worthy of repetition. We regret that was not your case. Amazing houses and warm welcome! Couldn't have been better! Both houses are beautiful and the gardens are just lovely. It's also ideally located, just next door to the main cultural attractions such as Quinta da Regaleira. Ana and Leonor are very reactive and welcoming. We enjoyed our stay. It's also perfect for young kids. We will definitely come back. Even though I can’t understand what you wrote I’m really happy that you and your family enjoyed your stay. I hope I can came again anytime soon! Ein landschaftlich schön gelegenes Objekt mit einer herrlichen Aussicht. Ideal um einen luxuriösen und entspannten Aufenthalt zu geniessen. Die beiden Häuser haben eine sehr gute Ausstattung und bieten ausreichend Platz. Am Pool kann man wunderbar relaxen. Die Gastgeberin ist sehr hilfsbereit und freundlich. Ich würde jederzeit wieder dieses Objekt buchen und kann es nur weiter empfehlen. Absolut super. It was a pleasure to receive you in our property. Hope you come back anytime soon! Na High Season a estadia mínima é de 7 noites com entradas ao sábado.